Once you've seen Siracusa's fine mainland archaeological sights, the most pleasant place to spend the rest of your stay is the island of Ortigia, Siracusa's heart for thousands of years. 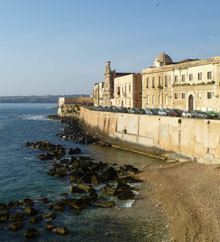 The island of Ortigia is the historical heart of Siracusa. There are fewer archaeological sites exposed to view here (the island has been heavily built-up ever since the time of the Greeks), but this is the part of Siracusa you're likely to be wandering around after you've 'done' the mainland points of interest. The tight-knit lanes are pleasant for strolling, and much of the island's charm lies in wandering down narrow medieval lanes, past romantically-crumbling - or lovingly-restored - Baroque palaces and churches. A walk around the perimeter of the island is a good way to begin to get your bearings. With a map and a guidebook you can locate individual buildings of note, such as the bizarre Palazzo Impellizzeri, lined with faces, but it's just as much fun exploring for yourself and discovering your own favourite places: abandoned palazzi where weeds and bushes swarm over the dilapidated balconies, corners where you catch glimpses of sky through once-grand windows, carefully-tended cactus plants, updated and inviting historic buildings, seafront churches, picturesque alleys and so on. Ortigia has many gems to discover - one of our favourites was the small Chiesa of San Martino, a simple and ancient church with a lovely interior, decorated with a mosaic in the apse. Ortigia is joined to the mainland by three bridges. The central bridge, Ponte Umbertino, continues the line of the wide Corso Umberto, one of mainland Siracusa's major thoroughfares. Straight ahead as you reach the island, you'll come to the majestic ruins of the Greek Temple of Apollo. Veering right up Corso Matteotti you'll pass a range of clothes and shoe shops, before arriving in Piazza Archimede, at the centre of Ortigia. Despite the stream of cars cruising around its central fountain, the piazza is nevertheless a fairly attractive focal point, and a good place to start your explorations of the island. The fountain depicts the myth of the nymph Aretusa, about which you will hear more. To head straight to Ortigia's most attractive piazza, turn right and head for Via Cavour (which continues as Via Landolina), a narrow thoroughfare lined with restaurants and souvenir shops. At its end lies Piazza Duomo, an elliptical open space lined with harmonious and impressive buildings - and also a good place to sit and enjoy refreshments at an outdoors cafe table (check prices carefully and inspect snacks before you buy). Alternatively, taking Via Roma from Piazza Archimede will take you up the backbone of the island, and past the small tourist information office. For a pleasant stroll during the traditional evening passeggiata, head towards the thirteenth-century Castello Maniace, the fortress at the island's tip. The route from here back to the Duomo, along the seafront to the Fonte Aretusa, then cutting inland, is adorned with several bars and restaurants and is a nice place for a summer evening promenade. 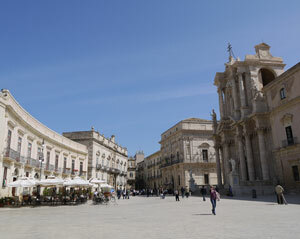 Siracusa's Duomo is one of the town's most celebrated sights. The building records the many ages of the town. Once it was the Greek Temple of Athena, with a giant gold statue of the goddess on its roof. The massive Doric columns of the temple are still visible; rather wonky after earthquake damage. The wall above the columns along Via Minerva, with battlements, is Norman in origin, while the fancy Baroque facade was a replacement after the 1693 earthquake. Inside the Duomo, you can see more evidence of the temple origins of the building, and more of the original structure. Those interested in relics can admire some fetching displays of saints' bones in the chapel to the right of the main altar, where there are also some appealing fragments of fresco. A small room by the exit (not always open) is a shrine to Santa Lucia, the patron saint of Siracusa, and contains offerings to the saint, as well as the usual relics. Over the years Syracusans have presented a range of precious items and jewellery, many decorated with the saint's 'eyes' motif. Santa Lucia, or Saint Lucy, is loved so much that Siracusa awards her two festivals a year, in May and in December, with the saint's statue being ceremonially removed from her side-chapel and placed in front of the main altar, before a succession of traditional festivities and the carrying of the statue through town in a colourful procession. Occupying an important place in the hearts of Syracusans, the Fonte Aretusa (on the western shore) is a fresh-water spring whose history goes back to the earliest Greek colonists. According to mythology, the spring is an embodiment of the nymph Arethusa, changed into a watercourse by her goddess Artemis/Diana in order to escape the attentions of unwanted suitor Alpheus (Alfeo). Since he too became a river in order for their waters to mingle, her ploy wasn't totally successful, though a local did descibe this to me as 'romantic'. A sculpture showing the scene is positioned alongside the spring. 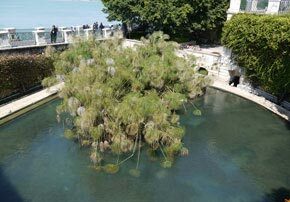 Surrounded by high stone walls, planted with papyrus and inhabited by white ducks, the spring is an important spot on the Ortigia passeggiata. Next door there is also a small aquarium that offers a burst of air-conditioned coolness in the summer. Siracusa's Regional Art Museum is located in the attractive Palazzo Bellomo (Via Capodieci) and houses art covering a wide timespan, from the Byzantine era up to the eighteenth century. Despite a recent redesign, the gallery is not very legible for the visitor and didn't, when I visited, provide any information, guides or floorplans despite its high admission fee. It is worth visiting primarily for an overview of local Sicilian, mostly religious art and for its treasure, Antonello da Messina's Annunciation. Although damaged and cracked, this painting has been restored and glows with revitalised colour. It is displayed, along with the gallery's other paintings, on the first floor, where visitors progress past art and statues from the fifteenth century onwards. Some less refined paintings are reminiscent of the Sicilian folk art you may have seen decorating traditional painted carts. There are some good sculptures, including an effigy of a dashing nobleman whose legs now finish along with his flamboyant breeches. Look out for a very curious boxed wax scene of the Plague dating to the seventeenth century but reminiscent of the more macabre specimens of contemporary art; an agonised corpse suspended over piles of bones and skulls patrolled by unpleasant crawling beasts. Back on the ground floor are displays of architectural features and sculptures, such as Byzantine columns and Norman marble decorations. There must have been fortifications at this narrow headland on Ortigia ever since the island was occupied, as it overlooks the entrance to Siracusa's sheltered bay, and is an obvious defensive site. The castle standing here now, however, dates back 'only' to the thirteenth century, when it was built on the orders of the great Frederick II, known as 'Wonder of the World' (who also built Puglia's Castel del Monte and other fortresses). 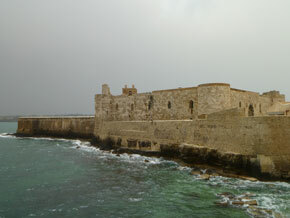 It takes its name from George Maniakes, a Byzantine general who commanded an earlier fort on the site. The castle is open in the mornings, and it is worth visiting as there is a great deal more to it than you would guess from the entrance. Visitors enter through rings of defences, until reaching the castle at the heart of the complex; a stern square with round corner towers. The central portal is a grand pointed archway decorated with many different marbles. Until recently the castle was a military site and off-limits; now a restoration has revealed the grandeur of the huge inner hall. Tantalising hints of the castle's many layers of history can be seen in places, from exposed ancient stonework to Second World War-era graffiti. On show within the castle is a copy of a large bronze statue of a ram. The original is in the archaeological museum in Palermo, and was one of a pair dating back to Greek or Roman Syracuse which once guarded the castle. The castle is open 8.30am-1.30pm. If it is raining or you enjoy subterranean exploration, you'll find two interesting and very unusual attractions to visit on Ortigia, which may be of particular appeal if you have children to entertain. The first, with an entrance in Piazza del Duomo, is the Ipogei di Piazza Duomo, a set of underground tunnels used during the Second World War as a refuge from bombing (Siracusa was bombed first by the Allies and then by the Germans). The origins of the rock-cut passages must be much older; they incorporate a vast old water cistern under the Archbishop's Palace. Visitors are let into the network of passages at set times (published on the entrance door, currently Monday-Friday at 11, 12 and 1) and accompanied by a custodian. Exploring the tunnels is fascinating, and there are information boards in English and Italian which explain the wartime usage of the site, along with photographs. The exit from the tunnels is on the waterfront of the Foro Italico. This lies between the aquarium and the departure point for boat trips, so families will be spoilt for choice as to their next move. The second underground sight is a very ancient Jewish ritual bath, or Miqweh, which lay hidden for centuries deep under the old Jewish quarter of Ortigia. Under Spanish rule, Siracusa's Jewish inhabitants were ordered to leave the city in 1492, and before they went they appear to have filled up the baths, and blocked the entrance. The secret was discovered at the end of the twentieth century during restoration works. The age of the baths is uncertain, but it is likely that there had been a Jewish population in the town for at least a thousand years before their expulsion. There are three plunge baths cut into the rock, filled with clean fresh spring water which courses along narrow channels, and two 'private' baths in separate chambers. It is a very atmospheric spot. The baths are situated below the stylish hotel-residence Alla Giudecca (Via Alagona 52), and to tour them you should arrive at the hotel reception at one of the set visiting hours: March-October 11am, noon, 4pm, 5pm, 6pm. Admission costs €5. A member of hotel staff leads guided tours in Italian and English. Note that the baths are down long steep steps and the surfaces underground may be damp. 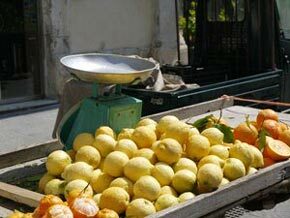 Siracusa has a vibrant and colourful market which takes place on Ortigia close to the mainland and fishing port, on and around Via de Benedictis. Outlying stalls sell clothing and general wares, but the heart of the market is devoted to local food produce, with rows of fishmongers displaying and hacking at everything from prawns to swordfish, piles of lemons, oranges, beans, courgettes, and heaped up spices, almonds, pistachios, cheeses, snails and all kinds of Sicilian speciality. 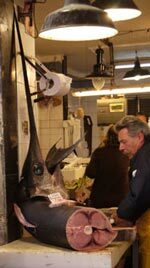 If the market stalls are too hectic for you, head to the end of the street nearest the sea, where you'll find a shop which is a foodie's paradise. The Fratelli Burgio store, Il Gusto dei Sapori Smarriti (Piazza C. Battisti, 4), specialises in local cheeses and other Sicilian products, and is a great place to stock up on delicacies to take home, or even fine picnic ingredients (ask them to make up a roll with their cheeses). For high-street type shopping, the best place on Ortigia is Corso Matteotti. More gastronomic specialities, wines, gifts and souvenirs can be found at shops along picturesque Via Cavour, and around the Fonte Aretusa. > Read on: places to stay in Siracusa - including the best hotels, and a B&B review. Our selection of the best (and the best value) Siracusa hotels and B&Bs, with reviews and online booking.